In the middle of 1700, the family name Cerruti appears in the communal lists under the heading “Arti et Negotij”, a term used in those days for somebody who manufactures cloths or has cloths manufactured. From the end of 1700 to 1881 various generations of the family have worked both as self-employed, as well as skilled, expert weavers in various factories in the area, accumulating the cultural and economic capital necessary to give life to one of the most extraordinary business and personal adventures of modern times. 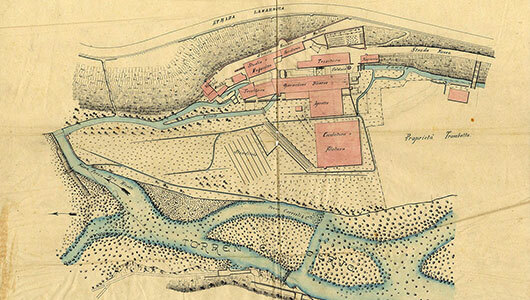 Antonio Cerruti together with two brothers and a cousin found the company, buy the mill and gives rise to the activity on the banks of the river Cervo where the company nowadays is still situated. Following a vocation still pursued, they turn to serious production of innovative and quality textiles, enjoying the first significant successes within a few years. Soon the factory is enlarged and more modern spinning and weaving machinery is put into action in the large rooms, already lit by electric light, a rare event in those days. Annual production, which in the first years of 1900 was equal to 10.000 pieces of fine combed textile, continues to increase at a constant rhythm and is partly destined for foreign markets, in particular America. 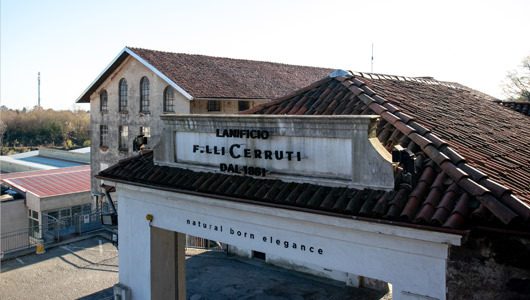 During the First World War, the efficiency of the plant guarantees ample production in the supply of grey – green cloth; in 1917 alone the Lanificio Cerruti produces 170,000 metres of it for the army. 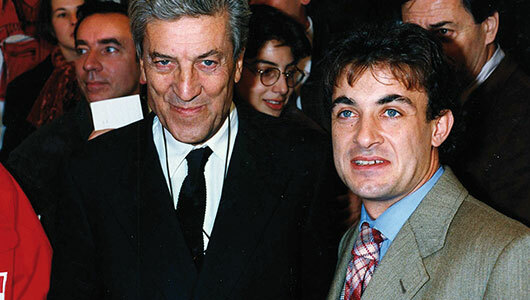 Silvio Cerruti, Antonio Cerruti’s son, manages the company together with his uncle Quintino, concerning himself personally with the quality and development of the collections. There follows a phase of consolidation of the prestigious positions gained on the markets, in particular those in South America and the Middle East, while the work of modernizing the spinning, weaving and dyeing plants continues. 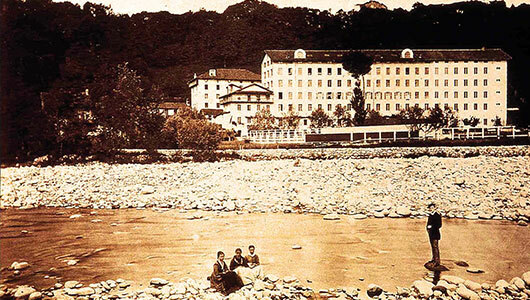 In 1945, about 700 employees work at the Lanificio Cerruti with 140 looms and about 7.100 spinning spindles, an extremely significant number if compared with those of other factories operating in the region in this period. In the same year Silvio Cerruti is appointed President of the Association of the Italian Wool Industry and succeeds in resolving, in a few months, the problem of determining the greasy wool quota to be assigned to the various companies, stimulating the upturn of the wool sector. Besides declaring the intention of producing only the highest quality textiles he dedicates himself to a radical restructuring of the strategic production divisions. 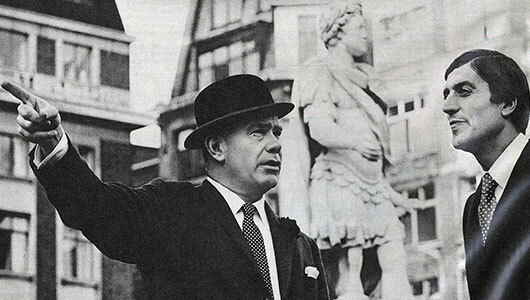 After the premature death of Silvio Cerruti in 1951, the eldest son Nino takes over as head of the company. Although he is only 20 at the time, he immediately demonstrates a unique aesthetic sensitivity and organizational ability, which go on to make him a fashion icon. In 1957 the designer decides to enter the world of men’s fashion and founds HITMAN, a company specialized in the production of men’s clothing. With a staff of 350 employees Hitman produces 120,000 garments a year in close collaboration with other 10 Italian companies. In the Sixties more than 50% of production was destined for the foreign market. Hitman launches Flying Cross, the first tailored luxury men’s prêt-à-porter, which originates from an idea by the tailor and designer Osvaldo Testa. It concerns a brand which is initially trendier, which in time develops a characteristic ‘Anglo-Neapolitan’ style, combining traditional Neapolitan tailoring with Anglo-Saxon taste in textiles. 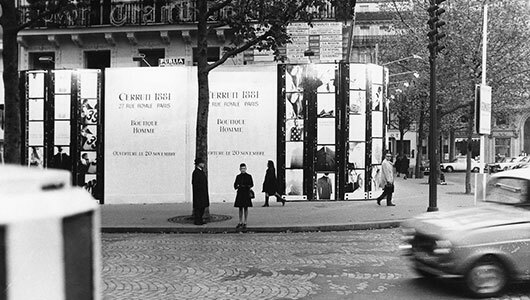 In 1967 Nino Cerruti inaugurates his ‘maison de couture’: he is the first designer to launch in Paris his own label of men’s high quality prêt-à-porter. In this way Cerruti 1881 comes into being, alongside the single label boutique in Place de la Madeleine. It is the first pret-à-porter boutique where men’s and ladies’ collections are displayed side by side . Vico Magistretti, world famous architect, studies an environment of an entirely new concept for the occasion in which the furnishings are completely composed of modules and arranged according to different first time in fashion that the male and female models walk the catwalk with the same clothes. Nino Cerruti becomes famous as the creator of “Casual Chic”, a luxurious, glamorous look which conquers the world and the market with a unique, thrilling style. Nino Cerruti is the unstoppable creative that with its innovative solutions will suggest a new route to Style and Fashion, in areas of absolute visibility such as those of Cinema and Sport, at the highest levels. So deeply to to bring him to the big screen: Nino Cerruti is the favorite designer of movie stars for events such as the ceremony of the Oscars or the Cannes Film Festival and he briefly appears in the movie “Holy Man” (The Genius), with Eddy Murphy, where he plays the role of himself: eager for flight, he asks the protagonist to help him with his hypnotic powers. After many European films, including “Borsalino”, Cerruti dress for the first time the actors of a film produced in Hollywood: it’s “Romancing the Stone”, with Kathleen Turner and Michael Douglas. It is the beginning of a long association between the designer and Tinseltown. 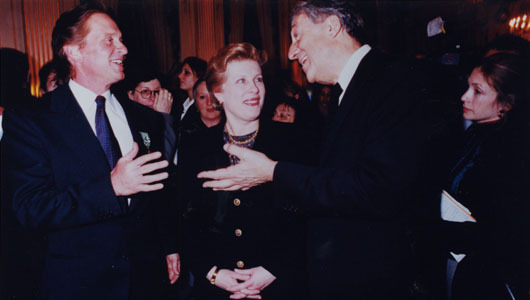 With its innovative approach to fashion brought to the big screen, Nino Cerruti became one of the most prolific designers for Hollywood and creates exclusive clothes for many movies (from Air Force One to Die Hard, from Indecent Proposal to Philadelphia , from Basinc Instinct to The Silence The Lambs, from Pretty Woman to Fatal Attraction, from Wall Street to The Witches of Eastwick) and actors (Harrison Ford, Jack Nicholson, Bruce Willis, Robert Redford, Tom Hanks, Sharon Stone, Michael Douglas, Richard Gere, Jeremy Irons, Diane Keaton, Marcello Mastroianni, Clint Eastwood, Sean Penn, Hugh Grant…) . 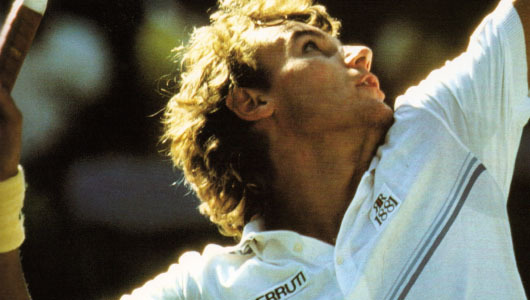 From skiing (with Ingemar Stenmark, the greatest skiers of all time, who gets his greatest victories wearing a Cerruti 1881 suit, also immortalized in a commemorative stamp) to tennis (with Jimmy Connors, who won 5 US Open, 2 Wimbledon and 1 Australian Open, which won the first place in the ATP rankings wearing clothing Cerruti 1881, considering it deeming a sort of lucky charm), from football (with the Ballon d’Or 1991 Jean Pierre Papin) to Formula 1 (the Ferrari team was dressed by the company Cerruti at the beginning of the 90s and same supplier for the spare time of champions such as Jean Alesi, Gerhart Berger, Jacques Villeneuve and Michael Schumacher was Cerruti). Nino Cerruti sell the fashion industry and dedicates himself entirely to the Wool Mill, his great passion. In 2005 he joins the interior design business and acquires Baleri-Italy, a leader company in the industry. 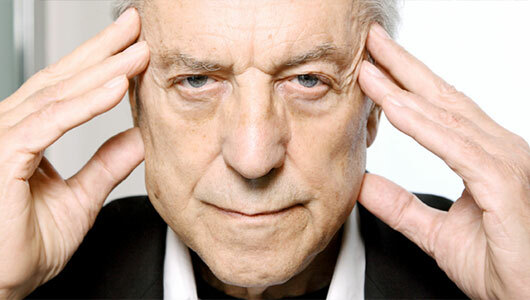 In the same year he is a member of the jury of the Berlin Film Festival. Before him, only two other Italians had held this role in the history of the prestigious event, further stressing his association with the world of show-business and with the international jet set. In 2006 he inaugurated the new headquarters designed by Vico Magistretti. It is the last project by the renowned architect in his long career. Nino Cerruti challenges the market again, with the usual spirit: remaining firmly anchored to the tradition of research and innovation that his family is running over two hundred years. Lanificio f.lli Cerruti is controlled since July 2018 by the London-based fund Njord Partners. 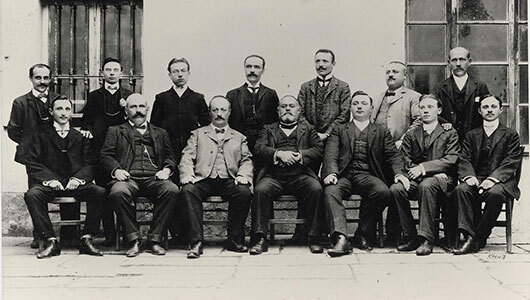 The aim of the acquisition is to bring sustainable growth in the potential of the Lanificio f.lli Cerruti 1881 brand. Mr Paolo Torello Viera is Chief Executive Officer, while the iconic Mr Nino Cerruti has taken on the title of President.